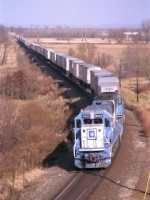 Description: A pair of Oakways lead train 12 through Rochelle. Description: They look good on intermodal trains too! Description: EMDX 9020 rests between assignments at the CSX (C&O) docks at Toledo, OH. 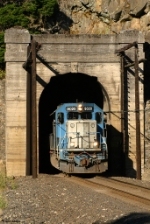 Title: EMDX 9020 near Bruno. 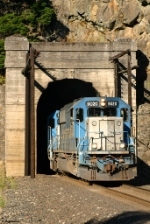 Description: Manifest train rolling through a slight sag heading south. Description: Getting the train up to track speed. Title: Rolling though town at speed. 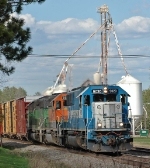 Description: A empty coal train with a trio of Oakway`s heads through Hebron, ND on it`s way back to Montana. Description: Oakway power for an westbound empty. Description: Two trains meet at Crews, CO. An unpatched SP leads a soutbound loaded coal train, while an SD70ACe leads a northbound manifest. Description: H-NTWGAL with four different painted engines. Description: EMD 9020 heads a nice little mirror image towards Lacrosse. 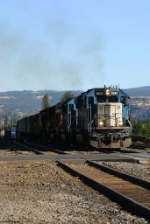 The EMDs are paired, the GEs are paired, and in the two pairs the newer unit is facing front. Description: A wonderful Northtown-Galesburg train departs town with three EMD's elephant, and the middle unit as the cherry on top. Description: 9020 and 9051 rest at Havana Street waiting for their next assignment basking in a late evening sunshine that amazingly burned through that thick cloud cover.